Coalition Against Communalism gathers to condemn the violence and demand justice for all victims in Gujarat; Indian Consulate presented with petition bearing 4233 signatures asking the National Human Rights Commission to ensure human rights and justice in Gujarat; Gathering draws 250. Setting up of an independent and impartial judicial enquiry. It rejects both the charter and the constitution of the current judicial enquiry. Immediate government assistance to victims. Equal and fair compensation to all victims, whether of the Sabarmati Express or of the communal violence. Gujarat Government to condemn, not explain, the violence. The Dismissal of the Police Commissioners in cities worst affected by the violence. That the recent decision not to apply POTO to the current violence is commendable, and needs to be sustained. An immediate end to all measures to curb the freedom of, and acts of violence against, the freedom of the press. People who signed the petition included film-maker Anand Patwardhan, former Chief of Indian Navy, Admiral Ramdas, social activist Lalitha Ramdas, author Chitra Divakaruni, Magasaysay award winner Rajendra Singh, Narmada Bachao Andolan activist Shripad Dharmadhikary, human rights activists Dr. Vineeta Gupta and Mukundan Menon, university professors Dr. D. N. Jha (Delhi University), Dr. Kamal Mitra Chenoy (Jawaharlal Nehru University), Dr. Raka Ray (University of California, Berkeley), Dr. Rafiq Dossani (Stanford University), Dr. Hari Sharma (Simon Fraser University), independent film maker Ali Kazimi, journalists Arundhati Parmar and Beena Sarwar, and leaders of Indo-American organizations Srikanth Nadhamuni (former President of Indians for Collective Action) and Pradeep Kashyap (Director of the Indian American Foundation). The march, orchestrated under the banner of Coalition Against Communalism, was a reflection of India in all its diversity - with representation from all its religions, brought together by the carnage in Gujarat. 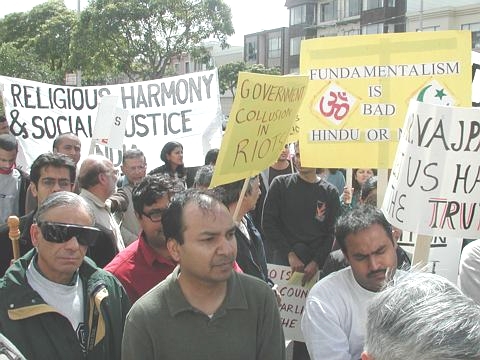 It was also a representation of an often silent majority of Indians living in the San Francisco Bay Area, who were outraged by the events in Gujarat, and believed that their voice needed an expression, and wanted to show the people of their support in these troubled times. On reaching the Indian Consulate, the marches observed a minute of silence to honor and respect all the victims of Gujarat. The march included a talk by Shalini Gera, the author of the petition, who debunked many of the myths perpetuated on what happened in Gujarat, and Why? According to Gera, this violence was neither spontaneous, nor expressive of a sentiment among the Hindus in Gujarat. It was pre-planned, meticulously executed, and often carried out in collusion with the civic, administrative, and political bodies. Furthermore, the government has been both biased and negligent in its provision of relief to victims of the riots. Gera also took exception to the claim by the Sangh Parivar to be both patriots and pro-Hindu, saying they neither represent Hindus in their distortion of its beliefs, nor the country in their rejection of its founding principles. 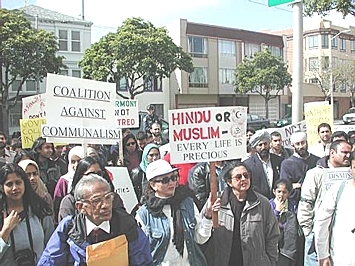 Hindus and Muslims, as with other communities in India, live together peacefully, and the recent violence was a deliberate and malicious provocation by people opposed to that fact. The Sangh Parivar, and in particular its more extreme bodies that function outside the political process - the VHP, RSS, and Bajrang Dal, were condemned by those who marched. 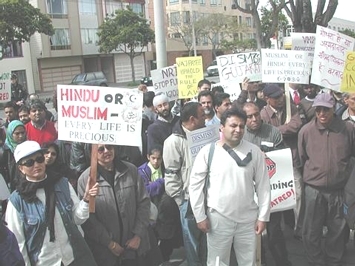 There were several slogans against the Vishva Hindu Parishad (VHP), which is active in the Indian community in the US, and has been directly linked to both the instigation and the execution of the violence against Muslims in the India. The speakers also made this point. Raju Rajagopal, an activist in the Indian community, spoke of the need for Indians everywhere to speak up against the violence. 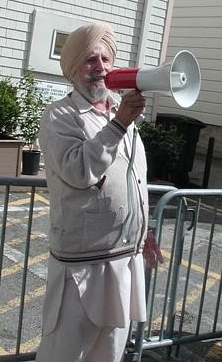 Gurdip Ankhi, who spoke in Punjabi, and has been active in politics in Punjab, spoke of the government forcing Indians everywhere to hang their heads in shame by their failure to uphold this most basic right of all citizens - the right to life. Samittar Uppal, of the Indian People's Cultural Association drew parallels between the challenges of today, and the work of the Gadar Party in fighting both for India's freedom, and their vision of a secular and democratic India. 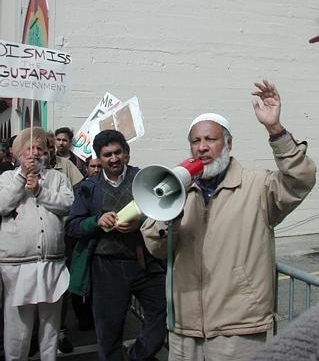 Manzoor Ghori and Omair Farooqui of the Indian Muslim Relief Committee read a statement condemning the violence. Syed ji of Hyderabad spoke of the fact that Muslims in India were Indians to the core, rejecting the Sangh Parivar argument on the external origins of Islam. Avi Singh also spoke of the need for holdings those responsible accountable under the rule of law, and the responsibility everyone shared in preventing these tragedies from reoccurring. Other speakers included Sanjiv Mahajan and Professor Angana Chatterji. Professor Praveen Sheth and Manzoor Ghori presented the petition to the ConsulateThe Vice Consul Saxena, on behalf of the Consul General, received the petition. "Religious Harmony and Social Justice in India"
"PM: Do your Constitutional Duty"
"We want a Secular and Democratic India"
"Vajpayeeji, Uphold the Rule of Law"
"VHP Represent Hindus - What a Joke?" "Bring all Law-Breakers to justice now"
"We must stop this violence now. I urge the government and the human rights groups to do their part to end it. I pray for all our brothers and sisters who have suffered in this hate-filled carnage in India." "We must condemn crimes committed in our name, and plan for long term strategies toward secularizing India and Indians so we might honour the promises we have made to each other in the name of democracy, justice and freedom for all her citizens." "This is not just a Gujarat issue. This is not just an Indian issue. This is about upholding the constitution and law & order." © 2002-2003 - Coalition Against Communalism. Site hosted by ektaonline.org.